The Federated Farmers survey is conducted by Research First twice a year (January and July) and 1070 farmers responded to the questionnaire last month. 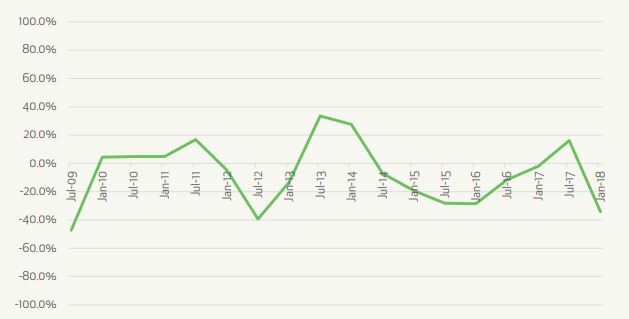 In terms of optimism about general economic conditions, there was a drop of 23 points compared to July last year and a 50 point drop when asked about the 12 months ahead. "That’s quite a hit, but it needs to be viewed in context," Andrew Hoggard, Federated Farmers Vice-President said. "Pretty much all recent surveys of businesses have found a drop in confidence because of the disruption and uncertainty over October’s general election. And in mid-January, when our survey was done, farmers in many regions had endured weeks and weeks of little or no rain." Last month’s survey found that optimism about future farm production fell for the first time since January 2016, with dairy farmers the most pessimistic. Andrew said it was telling that farmers in all regions expected production to decrease, but particularly those in Taranaki-Manawatu and Otago-Southland, the two areas most affected by drought. Just over half of all farms are currently making a profit (53.6%), which is slightly lower than six months ago, but the proportion of farms making a loss has stabilised at 9.3%. However, optimism about future profitability has halved over the past six months and pessimistic perceptions have quadrupled. "Again, some context. Dairy commodity prices were on a downward trajectory for the last half of 2017 and at the time of our survey were only just starting to go the other way," Andrew said. "It was the dairy sector which suffered the biggest drops in production, farm spending and similar indicators. Meat & Fibre farmers weren’t so bad." Similar to the July 2017 survey, the greatest concern for farmers was regulation and compliance costs. The dry weather was also on their minds, and worry about climate change policy and the potential for livestock emissions to be included in the ETS showed a marked increase. The ability to recruit staff is becoming increasingly hard - the hardest in the 18 surveys that have been carried out since 2009. "Federated Farmers is trying to head this off with initiatives such as our new dairy apprenticeship but this trend is also a message to politicians that as they tinker with immigration settings, the needs of rural New Zealand are very different from what’s going on in Auckland." Biosecurity (21.3%) leap-frogged the economy and business environment (16.1%) as the issue that farmers wanted the Government to treat as the No. 1 priority - no doubt a reflection of worries over the spread of the cattle disease mycoplasma bovis. Wait until all the non-farming and non-business experts come on here inflicting their opinion........they are the same ones who are backing our elite communist leaders. Says the self proclaimed expert in farming and business, who actually thinks we have communist leaders. Seriously, some people need to get a grip. You cannot force people who can control their net income, and therefore their tax liability, to Produce and be Taxed if they don’t agree with the uses to which said Tax is being put. They will quietly arrange their production to suit their own need for income. E.g. in most farming situations, the distinction between living expenses and small luxuries is quite invisible. The Hilux gets you up to the ski slopes or the boat down to the water, and you can go fly fishing up the river or surfcasting on the beach with the King Quad. Revenue drifts down to equal expenses (which includes all living plus small luxuries), capex goes into hibernation, maintenance mode takes over, staff are put on contract or shed, and it's feasible to simply hunker down and wait for the madness to end. This has implications for Gubmint tax revenue (paid on net farm revenue), as well as on prevailing prices for whatever's produced. The point is simply that Producers (generalising massively) have the option to Go Galt. Sadly, it’s the model. Look back a few years: In 2012 at a Fieldays/University of Waikato seminar http://www.waikato.ac.nz/news-events/media/2012/value-of-farming-in-capt...) (spelling courtesy the university), "Landcorp CEO Chris Kelly says if you want to get cash rich, don't go farming. The value in farming is in capital gain and as our land values increase we will continue to see fewer but larger farms. "He said overseas buyers are interested in New Zealand for several reasons. For the Chinese, it's safe and quality food products. For others, like Hollywood's James Cameron it's a lifestyle choice - they're not in it for the cash, they just want to own a farm in New Zealand and visit for a month or two each year. Others, particularly intergenerational families with cash, are looking for a safe haven post-financial crisis and buying New Zealand farms as a strategic asset, looking for long-term capital gain." We need, as a nation, to focus more on selling things others in the world want most, need a lot, and - crucially - value highly. Other than our land. businesses need capital to expand, and whether we like it or not, equity in property has allowed NZ Inc. to grow under a Key/English government. With capital gains either eroding or being extinguished by Labours policy settings, then over time credit will become harder to source, and the economy will stagnate. Yes, kane02, businesses need capital. And capital allocation is usually - or should be - directed towards increased revenue and profitability. Not - or not in performing businesses - sunk in debt in hope of capital gain. New Zealand needs a high performing rural/agricultural economy. We all need this - we live in an added value society. We need to create and capture added value in our agricultural produce as much as in any other production in order to support and benefit our society. Difficult if you're mired in debt. Only creditors win then. And, after a while, even they cut loose. Lets pretend Im the Fairy Godmother and can grant the farmers one wish. Just one, but not next months prices for dairy, lamb, beef, pelts, wool or the sunshine, rainfall or the bank manager. IMHO, it would be to have their beloved National party back in power, safe in the knowledge they can continue to drag the chain on a number of issues . eg,rampant non-compliance of environmental and employment law, farming for tax free capital gains from selling out to foreign "investors". Yes, or even better a return to subsidised production, i.e. supplementary minimum prices. With UK returning open arms to its empire they may get their wish. Damien O'Connor has said 'there are a lot of leaders, but no leadership' in farming. You may be surprised how many farmers agree with him. Yes, my comment was a plea for strategic thinking, for example retire uneconomic freehold, reclaim the remaining pastoral leases, reward the farmers for care of the enviroment...abolish Lands and Survey. Consider subsidies on domestic consumption....and tarrifs on imports or quotas. I wonder what the terms of the commercial transit insurance were.